I came away from that practice absolutely blown away by Hookfin’s athletic ability. I cannot emphasize enough how well this young man runs. Completely fluid in his lower body. Very flexible. He’s a natural athlete. He has to be a 4.8 perhaps even 4.7 guy at 6’5 265 lbs. He has a nice frame on him. Thick hands. Will comfortably hold around 300 lbs. Definitely one of the best athletes I’ve seen at that position in a while. Hookfin really just started playing football last year. He played on the defensive side in 8th grade and then was injured during his freshmen and sophomore seasons. So, he played his junior year and is now doing well into his senior season. I was interested in seeing more of Hookfin so I went to watch him play last Friday night. What you notice right away is how quickly he gets out of set. He can stay in front of anyone and the opposing team had some defensive guys with athleticism. He flashed the ability to roll his hips and plant someone but for the most part, I saw him position blocking. I’m slow to criticize a player for this because you really don’t know if that’s what they’re being taught to do. But it is clear to me based on a few things I saw and just how strong Isaiah is and how big his hands are that he is the kind of guy who has the ability to steamroll his man. He’s still learning how to use his hands as weapons. He put his hands out there but he doesn’t lock on right now. That’ll come though. Again, give a guy like a Hoofkin some time in a program where he will be developed and he could very well end up being a draft guy. As we mentioned last week, he does plan on taking the trip to Texas for an unofficial visit this weekend. 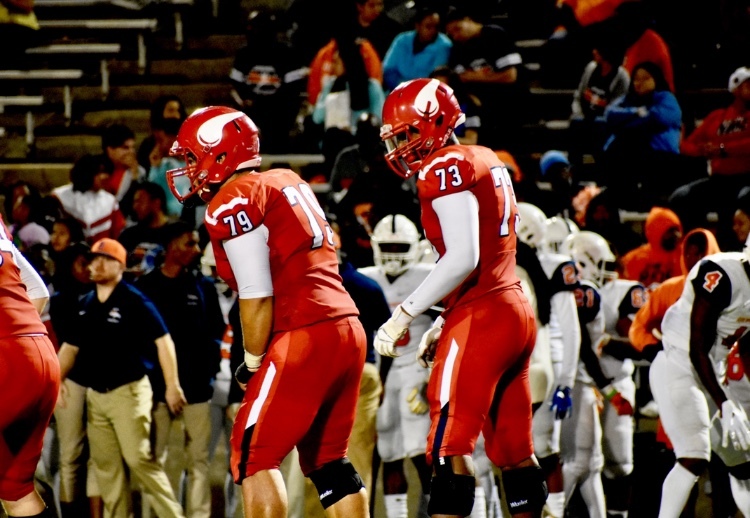 Texas has yet to offer but I imagine the staff just wants to get a look at him and make sure they see a guy with the size and frame they can develop. Also, it’s worth noting that while Texas has been working to flip Andrew Coker, Coker let me know that he is no longer visiting Texas this upcoming weekend. When I saw Coker in action a couple weeks ago he mentioned that he’d be at the West Virginia game. But he let me know earlier today that he won’t make it in. I’ll check to see if that’s going to be rescheduled. Back to Hookfin. He’s really starting to pick up steam on the recruiting trail. Last week he picked up a Baylor offer. And, last night he picked up offers from Mississippi State and Auburn. I went out to Many (LA) to see 2019 Texas defensive end target, Myron Warren. I stopped by Lufkin’s practice before that and ended up missing much of the practice in Many. So, I didn’t get a chance to see Myron move around. But I really don’t have any question marks about his athleticism. He’s truly elite in that regard. In fact, Myron grew up playing basketball and coach Jess Curtis, head coach at Many, says Myron can dunk the ball every which way you want it. Myron told me it was the encouragement of his friends, family, and coaches that really prompted him to first start playing football about two or three years ago. Myron agrees that it was a good decision. He tells me has athletes all through his family. In fact he has a cousin who played basketball at Nebraska. Myron certainly looks the part. I’d say he stands at around 6’3 and he’s nearly 240 lbs right now. Good frame on him. He’ll comfortably be 270 lbs. Extremely explosive off the line of scrimmage. Based on the film I’ve seen, he plays in an aggressive 30 front. Could really see him playing in an aggressive 30 or outside the tackle at 5 technique in a 4-man front – maybe even a Jack backer in college. In terms of recruitment, TCU was his first power five offer. Given Gary Patterson and company’s ability to evaluate, that’s a really good sign. Following his TCU offer, this past summer, he picked offers from schools like Texas A&M, Ole Miss and a number of others. In fact, Myron tells me that he visited Texas A&M over the summer and the original plan was to visit Texas on the same visit but due to time constraints the trip didn’t materialize. 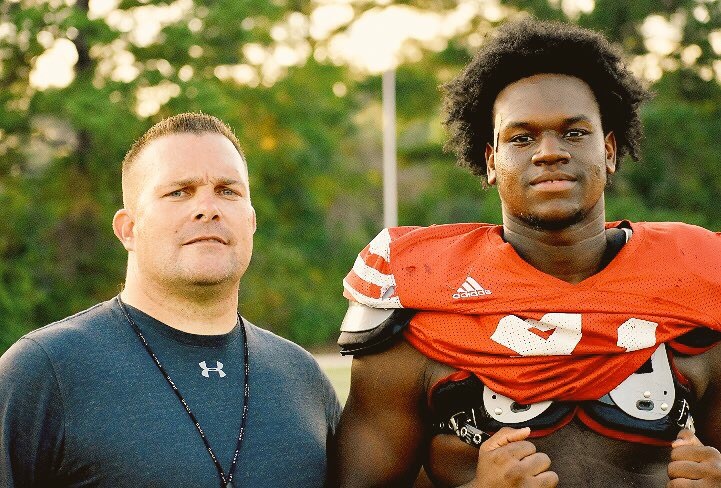 Texas has been in communication with Myron since the summer time, “they’ve been in the picture for a while…coach Oscar Giles contacted me right after I left TCU”. The Horns then pulled the trigger earlier this season. Once he picked up the Texas offer, Myron decided he needed to take some time and reevaluate his options. As such, he decommitted from TCU and says he has high interest in Texas along with three or four other schools. Myron described the Texas offer as “amazing” adding, “to get an offer from a program like that, it just made me want to keep working harder and harder and harder”. He continues to communicate with both Texas and TCU. This upcoming weekend he will take a trip to LSU. The Tigers have yet to offer but it sounds like it’s a possibility. I asked Myron if he grew up of any program, assuming of course that it would be LSU. He said, however, “I really didn’t have a favorite football team. I was just mostly into basketball. I just loved basketball. I kept up with basketball”. In fact, though Myron is from Louisiana he tells me that his kin are originally from the Killeen and Austin area of Texas. Having said that, should the Tigers offer, they’ll be stiff competition. But Myron insists that regardless, he plans on taking his visits including a visit to Texas. He’s scheduled to take his first visit to Texas as an unofficial visit on November 17th when the Longhorns face Iowa State. After the season, he plans to take his official visits. I had a quick conversation with Rishard Whitfield, aka “Footwork King”, last night. He let me know that he’ll be down in Austin this weekend and will be bringing three recruits with him. The biggest name of the group is North Forest (TX) ‘20 5-Star Texas A&M wide receiver commit Demond Demas. He’s currently committed to the Aggies but we’ve stated numerous times that this will be a battle all the way until signing day. A recruit to keep an eye on down the road that will be in Austin this weekend as well is Willowridge (TX) ‘21 wide receiver Latrell Neville. He holds early offers from Houston and Kansas. The third recruit is Tomball (TX) ‘20 wide receiver Logan Kyle. He holds offers from Syracuse, Kansas, and Tulsa so far. One recruit that’s missing is North Forest (TX) Texas offensive tackle commit Javonne Shepherd. I’m not sure the exact reason why he’s not coming to Austin this weekend with Whitfield. But I was told that he’s expected to be back on campus later this season for a visit. 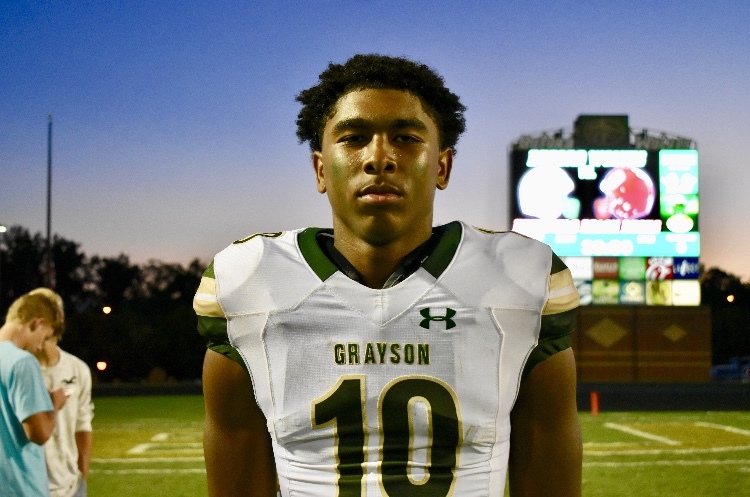 Recently, Texas offer 2020 GA WR, Ryan King (Grayson). Although King lives in Georgia, he is originally form St. Louis which is noteworthy because a) he doesn’t have the ties to the University of Georgia and b) Texas is batting a pretty good percentage right now with St. Louis targets. I saw King earlier this season at a game in Georgia and man, he is a big 16 year old. Probably around 6’3 or so and extremely muscular with a great length and width in his shoulders. Very powerfully built and a physical runner. But despite that, he isn’t stiff. He actually reminds me of a bigger version of Elijah Higgins. I’ll catch up with King later but did speak to someone close to him that said you can pretty much guarantee that he and his family will make it out on a visit. Texas already has one Grayson prospect in the boat with Kenyatta Watson. If you’re going to build a pipeline into Georgia, you can’t get much better than Grayson. ***Received word earlier today from Horace McCoy, father of Bru McCoy that it’s looking unlikely that they will be able to make it on their official visit Oklahoma for the Bedlam game. Horace said their schedule is tight from now until Bru makes his decision so it’s possible the visit won’t happen. It’s looking more and more like this one will remain a Texas vs USC battle with Washington in the mix a bit, as well. I can tell you that USC is going to have to assure a lot of their targets that things are on stable ground. Texas needs to end the season strong. ***As we previously reported, Noah Cain is scheduled to take his official visit to Texas this weekend. He still has his LSU, Penn State and Ohio State OVs remaining but with LSU looking like the probable landing spot for John Emery this is looking better and better for Texas. I’m on a plane now about to take off to Florida. I’ll be over at IMG sometime early next week. I hope to have more then. Let’s be clear, last weekend’s performance will not cut it. Don’t get me wrong, Texas dug themselves out of a deep dark hole, only to be denied further by a plucky Pokes team, credit to them. This week, West Virginia comes to town and while they are ranked higher than the Pokes, they come with a whole different set of strengths and weaknesses. Add to that, ‘Holgo’ always brings with him cutting edge scheme and this year is no different. We’ll get into that, shall we? It makes sense that we discuss defense first. The biggest challenge this week, especially after last, lies on this side of the ball. If Texas comes out flat again, the ‘Eers will set Joe Jamail Field on fire. Here’s the thing though, West Virginia doesn’t have a Cornelius, nor a Wallace. While they don’t need players like that this season to post big numbers, it does make defending them a bit more manageable. What’s strange, defensively, this match-up appears more straight forward than last week’s. Attack Grier – Grier’s protection has been lackluster this season. The ‘Eers offensive line has trouble at the gaurd and center postions. Something I liked from the West Virginia-Iowa State match-up was the Cyclones using their ends to contain Grier while bringing pressure against the center and guards. The ‘Eers have had plenty of trouble picking up all manner of blitzes in the interior gaps and it should be no different against Texas. Disallow lateral escape and attack the ‘A & B’ with a variety of stunts and blitzes. Zone – Texas had particular trouble against Wide Zone last week. The Pokes took advantage of Texas defensive line alignments last week by both pinning the end inside and wrapping the guard around that block. Also add a lead blocker into the alley or ‘arc’ him the opposite way and the numbers add up quick. Texas may be wise to set edges first with the ends, funnel runs up to the linebackers or force the ‘Eers backs to bounce out to the corners or safeties lying in wait. This fits with attacking Grier, the ends are either setting a hard edge or working up field to bracket Grier inside and allow pressure inside to collapse the pocket. As Tom Herman stated last week, ‘What didn’t we do?’ To win, stop the run, sack Grier, and force Grier to pass into coverage. No Passive Safeties – I get that Orlando wants to prevent bigger plays from occurring, but leaving two safeties back out of the action doesn’t help against many of these spread teams. I strongly prefer safeties working closer to the line of scrimmage, involved in attacking protection, and or bracketing receiving threats. This week, Holgo, along with Stills and company will attempt to create isolation in coverage. It’s important to mix how defensive backs fit runs because Holgorson (all coaches) generate big plays this way. If he knows exactly how you’re fitting a concept, he’ll deliver a kill shot to punish you for it. One way to combat this is to keep defensive backs off the line of scrimmage and bring them slightly delayed against the run. With the ends setting edges, linebackers taking away vertical entry, this gives the defensive backs time to read pass first, then drive down on runners in the alley. Formations- If I was Dana and Jake, I’d utilize more of the compressed formations I saw them run against Baylor. Oftentimes, defenses don’t have a lot of coverage answers for Bunch and Stack sets, let alone how it also effects run fits because of the extra gaps created with receivers and tight ends close to formation. Texas will need to plan for this, to both attack perimeter runs against compressed formations and receivers releasing into pattern. Last week, the offense started great. Then, it fizzled like a flat soda. It took the ‘Horns a bit of time to get the ball rolling again. Part of that was due to the Pokes’ physical play, especially outside. Expect more of that this weekend. Gibson defenses are notorious for getting their hands on receivers and making it difficult to break-off routes. The ‘Eers 3-3-5 defense modus operandi remains the same. They like to manage risk by attacking with numbers early, then dropping seven or eight in long yardage situations. Avoiding too many of those will allow Texas to win on offense. Attack The Blitz – One thing about blitzing is that it often leaves you short elsewhere. Texas runs multiple schemes pretty well at this point, with Inside Zone being somewhat close to what I’d call their ‘bread and butter’. With Gibson bringing heat nearly every standard down, it’s important for Texas to carefully plan formation and utilize ‘split’ backfield action while staying tight in the box. This also helps keep some heat off and forces the defensive front to account for newly created gaps to either side of the ball. Also, formation comes into play by creating space and angles. I noticed Baylor utilized Trips in to the boundary. This often forced the defense to align two-over-one to the single receiver field side. This essentially creates ten vs nine to the boundary. Texas would be wise to do similar by also bringing players in tight to formation to a side and forcing the ‘Eers into two-over-one or three-over-two situations. Then, you crack heads inside. Again though, this is all about tempering the blitz. There are plenty of tools to do so, but when you have players like Beck and Humphrey, it allows you to create many different looks and alignments that challenge a defense’s run fits and coverage variation. Tunnel & Slow Screens – Texas is finally executing Tunnel Screen at a high level. It should be going to the well with it more often. One concept we haven’t seen in a while is the running back slow screen. Against a pressure team like West Virginia, it’s a good idea to let them come and attack the space they’re leaving behind. While these aren’t run frequently, they can be utilized against a variety of defensive looks. Eight-Man Fronts – West Virginia will not be messing around trying to let Texas run the ball. They play a lot of eight-man boxes with one safety high. That means you’re seeing a bit more Cover One and Three from their defense. This is now unusual in the Big 12. However, this allows for more direct attacks into coverage. There will be some space against off-coverage outside. Also, the Seam can be attacked. This needs to be done with care. By running more than one seam route, Texas can challenge West Virginia’s single-high safety coverage. Slant and Pivot also become effective against the type of leverage you see in Cover One and Cover Three. These are some of my observations and ideas. I’m always curious what the coaches decide for game day. While this game will be difficult, I do feel Texas has a much more clear target to attack. Grier makes the offense go. Attack and sack him and the whole thing comes crumbling down. Iowa State managed to limit this offense better than I’ve ever seen. Texas has similar personnel to operate and execute in a similar fashion. This one should be fun, enjoy! – WR Josh Moore (Shoulder) Josh Moore has surgery on his shoulder. Done for season. 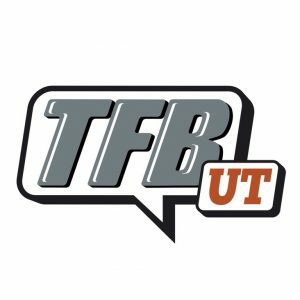 – DT Chris Nelson (Ankle) Rolled ankle in practice. Will be held out for WVU game.